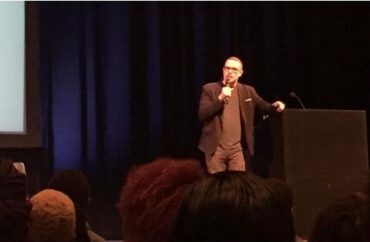 Activist Shaun King visited Columbia University on Monday to speak to students about social justice and police brutality, yet refused to tolerate questions from students who asked difficult questions, one of which included stats showing cops kill more whites than blacks. King started his speech with vague generalities about how the quality of humanity does not always go in an upward trajectory. The New York Daily News senior justice writer and Black Lives Matter co-leader then proceeded to show infamous videos of police abusing black people. At one point he also compared lynching in the 1800s to police killing unarmed African Americas. He also cited a statistic claiming 102 unarmed black people were killed by the police in 2015. During the question-and-answer period, I challenged King by prefacing my statement with the fact that, in 2015, white people were six to seven times more likely to be shot than unarmed black people, citing statistics reported in The Washington Post. Although I still had not even finished asking my question, King immediately told me to “stop talking” and that this was “a lie.” As I attempted to tell him where I got this statistic from, King refused to engage with me. I was then told to sit down by the person moderating the question without finishing my query. I find it amazing that King — who is pursuing a PhD in history and is a respected journalist — would silence the marketplace of ideas simply because he could not fathom the fact that white people are more likely to be shot. Later, King was challenged by another Columbia University student. Sophomore Jonathan Schatz-Mizrahi asked King: “Can you define the quality of humanity and is America more institutionally racist today than it was in 1945?” To which King said that he could not answer the first question and did not address his second question. One student even attacked Schatz-Mizrahi for being a white man “who is taking up too much space” at this event. It was also no surprise that the crowd booed myself and Schatz-Mizrahi, as King also claimed Schatz-Mizrahi and I had narrow viewpoints of the world. He then mocked us by saying that at least we each have someone to share our “narrow viewpoints” with. “They [social justice activists] are always talking about power dynamics and they’re using their power to obfuscate and not answer our questions,” he added.